In 121 B.C. the consul L. Opimius inaugurated the Temple of Concord that had recently been constructed at his behest. At the same time the Basilica Opimia, which was named after him, was built next to the new temple. Its history was closely connected to the temple: when the Temple of Concord was torn down between 7 B.C. and 10 A.D. (under Augustus’ rule) and rebuilt on a greater scale, the basilica of Opimius that had stood next to the old temple was probably also demolished and rebuilt. In its place the Temple of Vesta was then erected during the rule of the Flavians. In the civil strife between the Optimates (a faction that included the majority of the senators) and the Populares (the common people) during the late Republic, the consul and optimate L. Opimius eventually prevailed over C. Gracchus and his supporters by force of arms. The extreme brutality of these fights culminated in a tribunal decision that led to the execution of 3000 people. The rebuilding of the Temple of Concord has to be contextualised within this brutal urban conflict in 121 B.C. The building was meant to symbolise the victory and political triumph over the Gracchi and Populares trying to initiate reform. At the west end of the Forum, it was a prominent symbol of the peace (lat. concordia) that had settled on Rome. It is difficult to assess the construction of the basilica in this context. What is certain, however, is that both structures were built by the same politician and placed in a close topographical relationship to each other (see below). Just like the temple, the basilica served as a monument that symbolised the prestige and triumph of L. Opimius and the senatorial aristocracy in general. In contrast to the body of evidence that accompanies other basilicas, the source material for the Basilica Opimia is too poorly preserved to infer what specific purpose it served. It was most probably used for mercantile and/or administrative procedures, as is typical of basilicas in the late Republic. It is also conceivable that the basilica of Opimius was used for various political functions (comparable to the gathering of senators before a session of the Senate in the Temple of Concord). When reflecting on the basilica’s function, it is crucial to bear in mind that the building was not indispensable to the happenings in the Forum: indeed, it was demolished around one hundred years later. Most scholars assume that the rebuilding of the Temple of Concord and its extension under the later Emperor Tiberius around 10 A.D. led the basilica to be torn down, because the space it had occupied was needed for other construction projects. The fact that the Basilica Opimia was expendable at that time might also relate to the fact that two magnificent halls were erected in the late Republic and early Imperial Period – i.e. 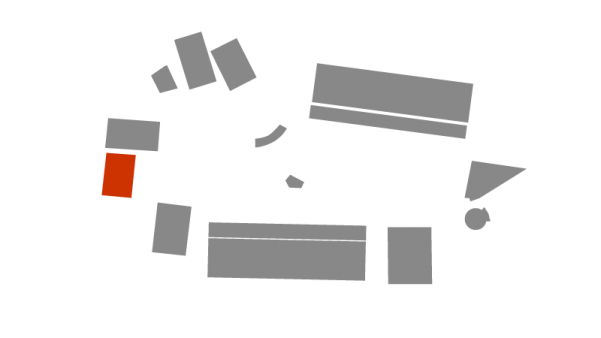 the Basilica Paulli on the north side and the Basilica Iulia on the south side of the Forum – and the fact that the Forum Iulium was built north of the Forum Romanum and the Forum Augustum adjacent to the Forum Iulium. The creation of numerous alternative public spaces might have made the basilica superfluous on the Forum. Although it cannot be denied that the Basilica Opimia existed – it is often mentioned in the literary sources – to date we have not been able identify any of its archaeological remains. We have not even been able to determine the exact location of the basilica, which problematizes the digital reconstruction from the very first. The terrain, together with the available area, impose different constraints on precisely where in the Forum to reconstruct the basilica. Some ancient writers state clearly that there was a close topographical relationship between both of the buildings of Opimius, the Temple of Concord and the Basilica Opimia. Because we know where the Temple of Concord was located, the question remains on which side of the temple the basilica was situated. It has been demonstrated that the temple area was delimited by roads on the north and east side, so neither of these sides offers a possible location for the basilica. A location north-west of the Temple of Concord is also doubtful, because the Capitoline Hill lies directly behind the temple and the space available there for the basilica would be too small. It has also been suggested that the basilica is one and the same with the temple, but this hypothesis is inadequate because the ancient sources clearly speak of two independent structures. Therefore the only plausible location for the Basilica Opimia is the area south of the Temple of Concord. This area was situated directly on the road leading up the Capitoline Hill (clivus Capitolinus) and was thus a prominent and effective position for Opimius’ structure. Later this area was occupied by the Temple of Vespasian. Unfortunately we have no archaeological evidence for the earlier structures of the Temple of Vespasian. 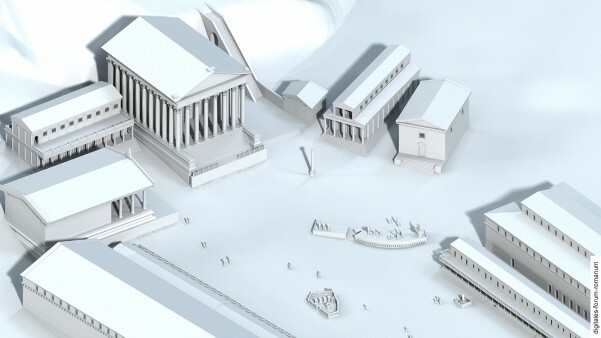 However, it is highly plausible that such a prestigious location at the west end of the Forum Romanum had already been used in earlier periods. This area also acquired further fame when Caesar relocated the Rostra to the west side of the Forum; so it only seems logical to suppose that the west side of the Forum was occupied by buildings erected by the Princeps Augustus and his family during the early Imperial Period, and that earlier structures of other aristocratic families had been successively demolished to make way for them. (This tendency can also be observed on the other sides of the Forum: the basilicas at the north and south sides as well as the Temple of Caesar on the east side; see Augustan II). Unfortunately we can only base our reconstruction of the layout and upper architecture on a vague conception of the Basilica Opimia’s location in the Forum – namely in the space between the Porticus Deorum Consentium, the Temple of Saturn and the Temple of Concord. 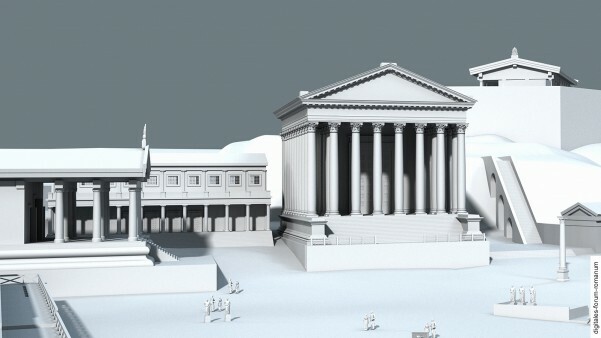 In light of this, our reconstruction draws on contemporary basilicas from different cities in Italy (such as Alba Fucens, Cosa and Pompeii) which can give us an approximate idea of the “archetypal” appearance of a basilica from the late Republic (although there is some variation among the different buildings that we compared). In his work on the theory of architecture, the Augustan writer Vitrivius also mentions the ideal proportions of such basilicas; however, these often cannot be squared with the structures that have actually been preserved, so this evidence is of limited use for our reconstruction. A typical characteristic of the basilicas of the late Republic is that their interior is divided into a middle aisle and two side aisles by the way the pillars are arranged. The exterior walls could also be replaced with a certain arrangement of pillars so that the building would have no enclosed interior space at all. Our reconstruction of the Basilica Opimia envisages it as a hall with three aisles and two storeys, proportionate to the space (about 41 x 25 m) that was available. Of course this reconstruction remains merely hypothetical, but it fits the parameters dictated by the topography, the space that was available and other comparable contemporary basilicas. 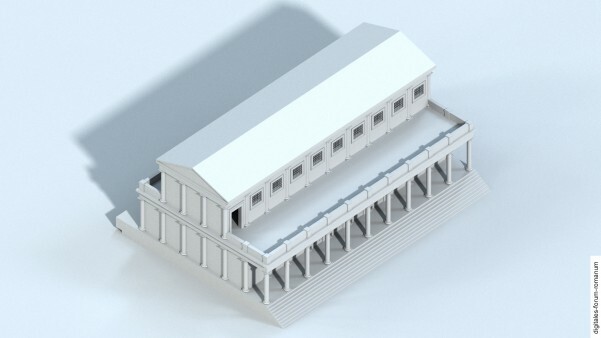 In our reconstruction the building is 41 m long, 25 m wide and around 16 m high. Thus the basilica seems fairly small in comparison to the monumental halls on the long sides of the Forum (Basilica Fulvia, Basilica Sempronia), but it matches the scale of Opimius’ Temple of Concord that stood adjacent to it. Ultimately the basilica was supposed to supplement the graniose effect of the temple, not overshadow it. A. M. Ferroni, Basilica Opimia, in: E.M. Steinby (ed. ), Lexicon Topographicum Urbis Romae I (Rome 1993) 183. C. Gasparri – S. Allegra Dayan, Aedes Concordiae Augustae, I Monumenti romani 8 (Rome 1979).